Musimenta Winnie is a 17 year old, HIV positive orphan who has been under the care of her uncle since 2005. Life did not turn out the way Winnie expected nor did it get better over the years. The care provided by her uncle was inadequate and unlawful. Her basic needs were barely met, her uncle stopped her from taking ARVs, and he began seizing her parents' properties. The situation worsened in 2013 when her attendance at school became irregular because she could no longer access scholastic materials. Moreover, her uncle had started selling off some of her parents' properties. The poor girl desperately approached Ssewajje Emma; a paralegal of Kasankala parish trained under the Rakai Community Based Rights project. The paralegal swiftly intervened and advised the relatives of Musimenta to organize a clan meeting to discuss the estates of the deceased and the future of the orphans. Despite the fact that the meeting was held, and the members resolved that the estate be handed over to another relative who could manage it properly, when Winnie attained the age of the majority, the uncle refused to hand over the estate. With the uncle's refusal, Emma turned to law enforcement for assistance. He referred the case to Lwamagwa Police Station. The police were able to track down the person who had purchased the property; however, they failed to take action. Emma then referred the case to Rakai Police Station. With the support of the District Police Commander, the case was successfully settled when the buyer was asked to immediately vacate the premises and stopped any developments on the banana plantation. Consequently, the poor girl regained control over land. An alternative care family was also identified for Winnie. 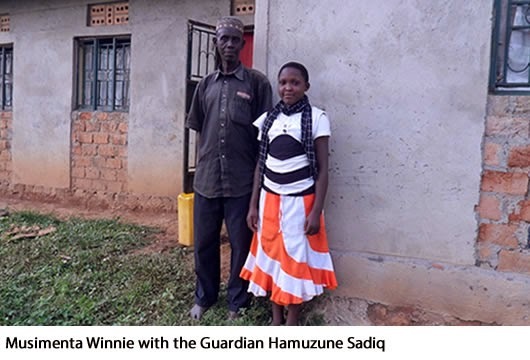 Winnie is currently happy living with Mr and Mrs Hamuzune Sadiq of Nongo village (another relative to Musimenta) in Kasankala parish. She has also resumed taking ARVs and attending school regularly. In English: "I am very appreciative of the support by Mr. Ssewajje which has significantly changed my life. As of now I have secured my land, regularly attend school and not worried about the future despite being HIV positive"